Dan Braid's try earned Sale a narrow victory to end their four-year wait for Premiership victory over Harlequins. 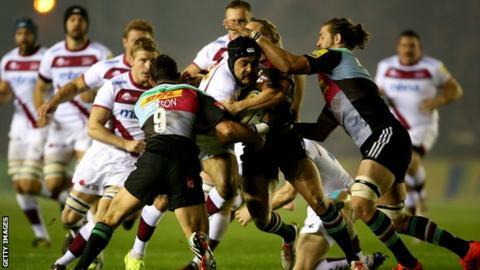 Nick Evans and Danny Cipriani kicked three penalties each in cagey affair at Twickenham Stoop. But the game came alive on 68 minutes when captain Braid forced himself over the line and Cipriani added the extras. Quins searched for a response but had to settle for losing bonus point, while Sale claimed their first league away win of the season. It was also the Sharks' first win at the Stoop since May 2008. The result also meant Sale leapfrogged their opponents into sixth in the standings. Harlequins, buoyed by last weekend's win over Gloucester at Kingsholm, looked the most likely to cross the whitewash but it was flanker Braid's score that proved decisive. Cipriani's kick gave the Sharks the lead in the second minute and Evans levelled soon after when a powerful scrum from the hosts forced a penalty. The pair exchanged three-pointers again before the break, and the visiting defence was able to nullify Harlequins' building attacking threat, leaving the game poised 6-6 at half-time. Quins scrum-half Danny Care, dropped from the England squad for Saturday's game with Samoa, came off the bench to a warm reception shortly after the restart and his side pushed ahead with Evans' third penalty. The kicking battle continued though, as Cipriani stepped up to square the game again only for Evans to notch another three-pointed to make it 12-9 to the hosts. However, Sale made the breakthrough when skipper Braid turned and drove over the line from close range, after an Andy Forsyth break, and Cipriani added the conversion. Quins threw everything at the visitors in the final 10 minutes but the Sharks held out to secure their first back-to-back wins of the campaign. Harlequins director of rugby Conor O'Shea: "It wasn't pretty, was it? "As a game it was always going to be given the conditions. It was a very frustrating night. "We played the second half in the wrong parts of the pitch. Twice when we took the lead, we gave away soft turnovers and penalties off kick-offs by not clearing our lines. Sale director of rugby Steve Diamond told BBC Radio Manchester: "It's a good away win. The competition is so tight you rarely win away from home. "We've got a good side with our first choice out. Belief is a big factor to success and we concentrate on that and not the oppositions. "We want to have 25-30 points by Christmas and that will give us a chance of finishing in the top six. "It is a tipping point of the season, you can go on and achieve the points you set." Harlequins: Chisholm; Walker, Hopper, Casson, Lindsay-Hague; Evans, Dickson; Lambert, Ward, Sinckler; Matthews, Robson; Trayfoot, Wallace, Easter (capt). Replacements: Buchanan, Marfo, Collier, Twomey, Clifford, Care, Swiel, Turner-Hall. Sale Sharks: Haley; Brady, Jennings, Tuitupou, Arscott; Cipriani, Cliff; Lewis-Roberts, Jones, Cobilas; Mills, Paterson; Braid (capt), Seymour, Beaumont. Replacements: Neild, Flynn, Harrison, Lund, Easter, Fowles, McLeod, Forsyth.